I found this recipe in the Waitrose magazine of all places. 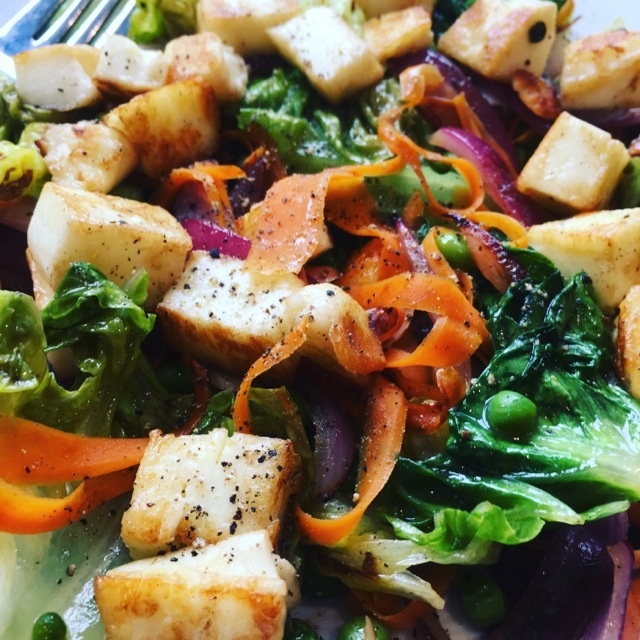 Created by grain & gluten-free bloggers Hemsley & Hemsley, this salad combines a few of my favourite things, one of those being halloumi cheese. Wilted lettuce is another feature that doesn’t get much press but is truly a sensation. Once you can get over your preconceived notions of how lettuce should be eaten, you’ll be throwing lettuce into your stir fries and including it as a warm side in no time. I love that this salad is warm. I love that most of the ingredients will probably already be in your fridge. I also love that the dressing is not the feature. There’s so much flavour and interest going on with this dish that a simple drizzle of lemon and olive oil does the trick. The most important factor with this salad is not to over-cook the halloumi. It only needs a flash-fry in a hot pan with a little olive oil. If you try too hard to get the crispy-brown exterior, you’ll end up with rubbery and even squeaky cheese but if you aim to warm it up only, you’ll come away with tender chunks of creamy halloumi. Fresh herbs, parsley and mint or basil. Add carrot, lettuce and peas, and add lemon juice and salt and toss together until the lettuce has wilted. Dish up the warm salad and at the last minute, fry up the halloumi and sprinkle it on top.